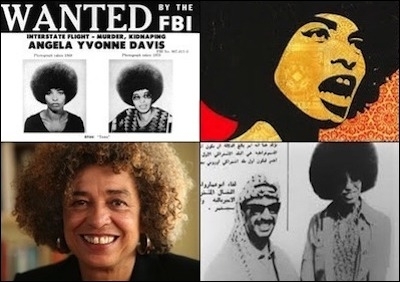 Angela Davis through the years. Angela Davis is neither a feminist nor an artist. But that doesn't matter, apparently, to the Brooklyn Museum. The museum's Elizabeth Sackler Center for Feminist Art, together with Gloria Steinem, will honor Davis Thursday as a "Feminist Scholar Activist for Social Justice," and as "an iconic figure ... a vocal champion in the fight for economic, racial, and gender Justice." New York City's first lady, Chirlane McCray, will welcome those who will have paid up to $3,500 to join the reception, program and dinner. It's true the Sackler Center has honored other non-artists, including Anita F. Hill, Connie Chung, Johnetta B. Cole, Chief Wilma Mankiller, Associate Justice Sandra Day O'Connor, Faye Wattleton — and Miss Piggy! More than half its honorees have, commendably, been women of color. However, other than the acquisition of Judy Chicago's great feminist work, "The Dinner Party," the center hasn't exhibited other major feminist artists (Nancy Azara, Mary Beth Edelson, Nancy Grossman, Joan L. Roth, Sylvia Sleigh) — a fact I find puzzling, if not offensive. Who is Davis? She's a Communist and a supporter of the Black Panther Party as well as homicidal British Black Power cult leader Michael X and the Soledad Brothers — who were acquitted of a prison guard's murder in 1970. That year, Davis was arrested and jailed for having bought the gun used in the Soledad Brothers' escape attempt: an attack in open court in California, which led to a shootout with the police and resulted in the death or injury of six people. She was eventually found not guilty. Davis doesn't talk about real gender and religious apartheid in Muslim countries. Look, this was the '60s and '70s; people — including myself — did and said things like this and were considered heroes. Then we learned about all the Communist gulags and about Islam. Some of us grew up. But '60s-style heroes are back in force. What's new: They've taken their show to the Middle East, where they're again backing totalitarianism and terrorism. Davis is often featured on the anti-Israel hate site Electronic Intifada, calling for an end to alleged Israeli "racism" and "apartheid." She has named the "dismissal of Palestinians" as "reminiscent of Jim Crow days," and has called for "black-Palestinian solidarity." Davis is a leader of the anti-Israel BDS movement, together with actor Danny Glover, author Alice Walker and Cornel West (who's advising Bernie Sanders). Davis is the lead signatory on a statement of "solidarity with the Palestinian people's struggle." Davis experienced her first visit to "Palestine" (with other "scholars of color") as a "nightmare . . . the wall, the concrete, the razor wire everywhere conveyed the impression that we were in prison." Deftly, she compares the jailing of black Americans with the jailing of Palestinian . . . terrorists. She tells her audiences that if they support BDS, "Palestine will be free." In the guise of anti-racism, Davis is a bigot — an activist Jew-hater. In her lectures, she doesn't condemn Jordan or Egypt for their anti-Palestinian actions, nor does she fault the many Arab and Muslim countries that have systematically refused citizenship and even employment to Arab Palestinians. Real feminists wouldn't be honoring a figure such as Angela Davis. Davis doesn't talk about the anti-black racism of Arabs or about the practice of real gender and religious apartheid in Muslim countries. She doesn't even fault the Palestinian leadership for torturing and executing its gays and dissidents or for forcibly veiling and subordinating Palestinian women. A real feminist would do so. Real feminists wouldn't be honoring such a figure. In early May, 100 activists and artists staged a protest at the Brooklyn Museum about "displacement both in Brooklyn and Palestine." This demonstration was organized by the Decolonial Cultural Front and Movement to Protect the People. No one mentioned the relentless Palestinian terrorism against Israeli Jewish civilians — or the enormous "displacement" and murder of Christians by Arab Muslims, or the "displacement" brought about by indigenous civil wars among Muslim Afghans, Libyans, Iraqis and Syrians, a "displacement" that threatens the stability and viability of the Western world.